Hi all, just to let you know had a really nice run out in my modded C5 today - as you will see I've been busy over the last few weeks. 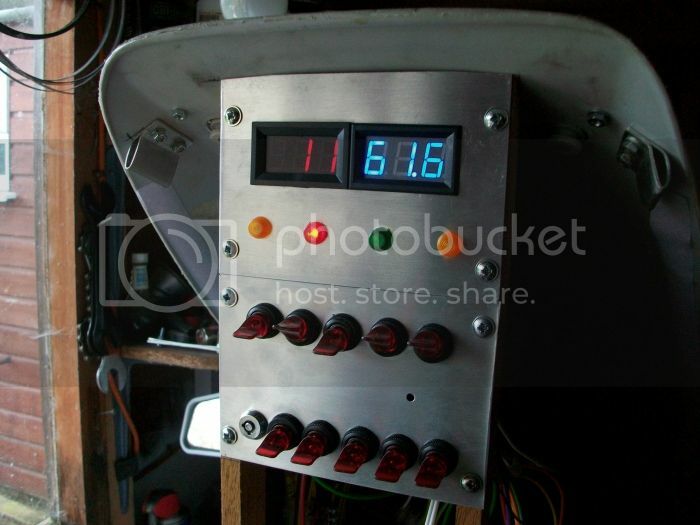 I have totally stripped and rewired the beast, all the main wiring and relays etc. 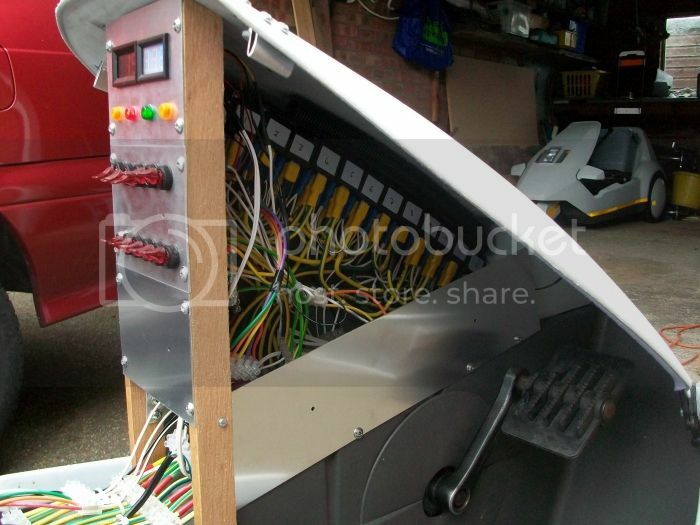 are now under the front panel on top of the transmission tunnel between the pedals - I have done this as it is easier to access all these bits and mod and repair etc, and it keeps them all out of the way of dirt and wet from the road. 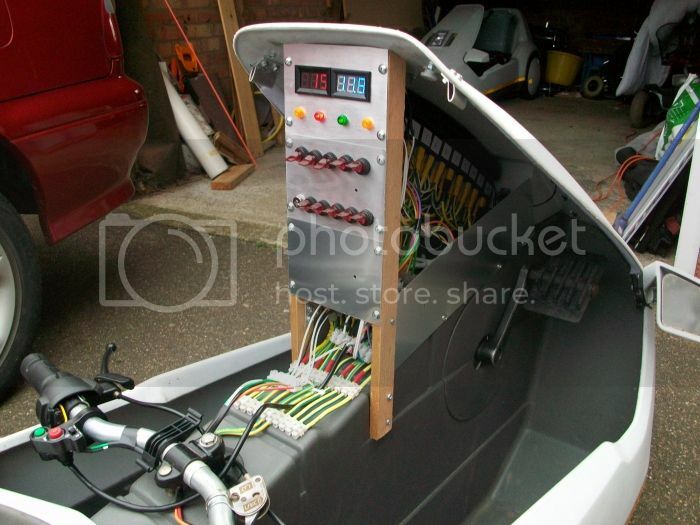 I can house up to 5 AGM scooter batteries, 2 in each footwell under seat and 1 fixed in the boot. Have put bolts thru the boot supports and my boot lock is mounted in an alloy plate. 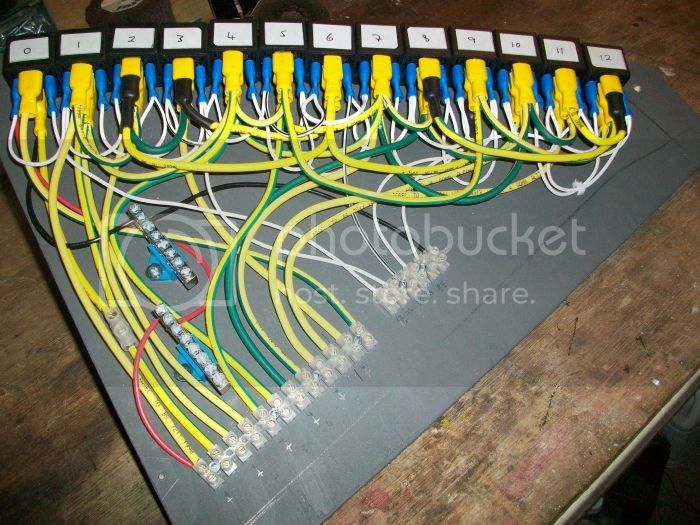 I have used 13 relays to allow me to run on 12, 24, 36, 48 and 60 volts - on 12v they are all connected in parallel, for the other voltages they are used in a combination of serial and parallel. 12, 24,36 and 48 volts are available from the handlebar buttons and all the above plus 60v available from the switches on the dash. I have added even more cooling holes to the motor and end case and have added an LED thermometer which updates more quickly than the previous LCD one. Also added handlebar controls for indicators, horn and lights (Hong Kong special £1.99) which work well. Am still using the tried and trusted Pep/Chas disc brake and my 3 speed sturmey gears. I had a run out today with just 1 scooter battery in the boot (am awaiting for more batteries to arrive) and I was surprised how well it went with just the one small (and light) battery in the boot, rather than my usual 2 humungus leisure batteries. Just waiting for my extra batteries to try up to 60 volts - will let you know how it goes - in meantime please have a look at my attached photos. Just a couple more pics I meant to put on but forgot. Doh !! 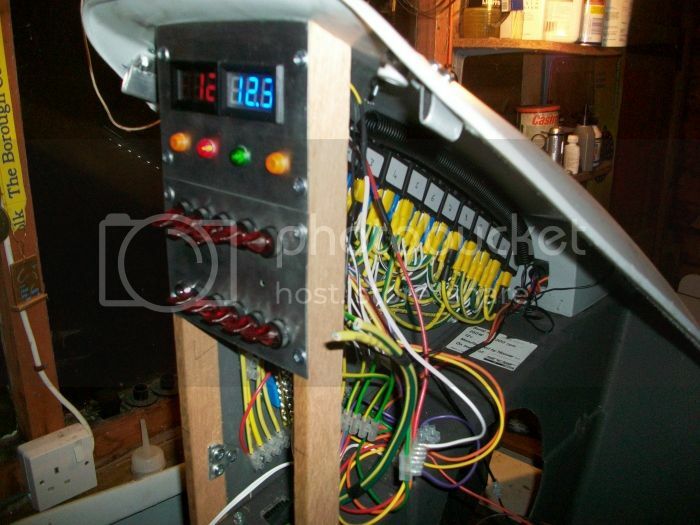 LOL Dave it has got a lot of wires, the wiring of the relays is a work of art. 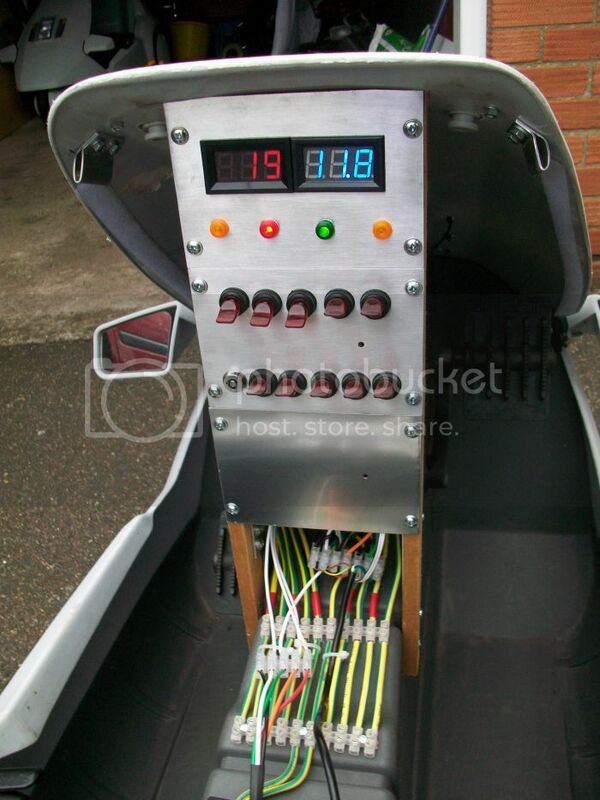 I dread to think what the top speed of it will be if the full 60V is used, you'll need to strap yourself in Kamztrad. Hi kamztrad, did you ever sort out your problem with the melting bush holders at 60v? If not, and you still want to continue, I may have a solution for you. Cheers. Karl. Hi kamztrad, This may look a bit long winded, don't worry it is. There is a two component adhesive called J-B Weld, this stuff is fantastic and expensive. When it sets it's like metal, you can drill and tap the stuff (I've done it myself many times), plus it's heat resistant, they claim, to 288°C. The idea that I have is to remove brushes etc from the motor housing and plug the holes in the casing with this J-B Weld. When it's set, drill and file the plug so that you can slide the brush housings into the aperture (i.e. a tight fit). But before you permanently insert the bush housings, slip a collar (metal or plastic) over the cable. This collar will be used to pot the cable and brush housing to the motor body. If you use a metal collar it can be left in place to dissipate the heat. The only problem with this solution is, IT'S PERMANENT. How to change the brushes in the future? I hope the idea may be of some use to you. Av phun. Karl. P.S. 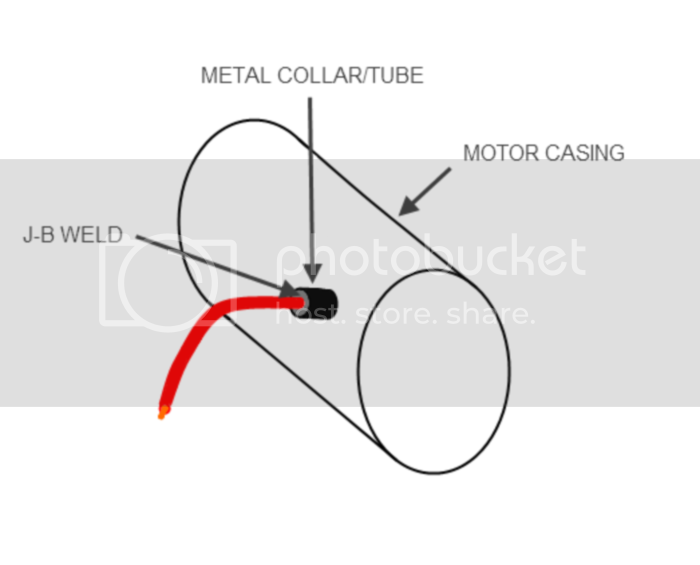 The J-B Weld can be bought in most DIY stores, car accessory shops, or like me, from ebay. The sort you need is the 'Formula Steel Reinforced Epoxy'.